I think if you’ve been keeping up on current [USA] events, mind you’ll know what the opening skit is about. Shout outs to Derek for creating/voicing the character of Johnathan America. 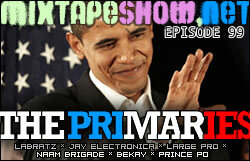 Other than that, though, this episode is all about first impressions. When you are a child of the MTV generation like I am, and you have crazy ADHD like I do, and you bought a Sidekick for the sole purpose of being able to IM and drive at the same time like I did, you rarely have the attention span for much beyond the first minute and a half or so of a new CD. And as anybody who has ever sold indie CDs out of a trunk on a busy thoroughfare will tell you, the first impression is the difference between a sale and an angry look. 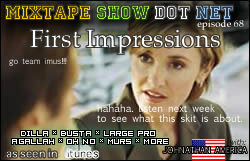 So this episode of your favorite hip-hop podcast is the First Impressions Episode – nothing but first tracks. Track 01s. This is probably one of my favorites so far. Hope you dig – have fun with this one. Oh No – Intro. 27 beats in 3 days? Damn. As much as I like dude’s older brother, I can’t remember the last beat that Madlib made that made me want to hit somebody (feel free to refresh my memory in the comments though). This one does that to me, but maybe I’m just violent. myspace.com/ohnodisrupt. Large Professor – Intro. The tempo might slow down a little on this cut, but your head should absolutely not stop nodding. myspace.com/thelargeprofessor. Agallah – Gangster. Summer of 2005 (okay I was late), this stayed in the deck like stupid. I replay this to the point where I should be sick of it, but I’m still not. This joint was my introduction to Purple City, period (again, slow). I don’t know if the mixtape is even available anymore, but if you can find it, there are some gems on Doomsday. myspace.com/agallahdonbishop. Stanza – Enter In. I wish I had found this CD in my stash before I’d started the Soul episode. Two minutes of telling you who he is, and what you’re going to hear for the next 48. The production and the wordplay are both worth a rewind. Probably the best surprise I’ve found in the mail all month. Recommended. myspace.com/stanzahiphop. Superiority Complex – Intro. See, these dudes get to talk all cocky like that in their intros, and the second I try things like that, females start looking at me crossways. Not fair. These two invite a lot of criticism based on their name alone (not to mention their insulting the rapping public at large), but I think their opening attack ain’t half bad. myspace.com/superioritycomplexmusic. outro loop: The Go Gos – We Got The Beat. Whoo boy. As always, hit up the comments section.